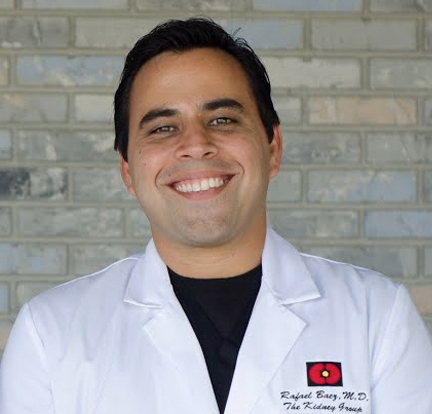 Dr. Baez completed his medical training including Internal Medicine Internship, Internal Medicine Residency, and Nephrology Fellowship at the University of Puerto Rico. During this time, he distinguished himself by being a member of the Golden Key National Honor Society in addition to being elected Internal Medicine “Resident of the Year” three years in a row (2007-2010). He was also honored as both Chief Resident in Internal Medicine (2010-2011) and Nephrology Fellow of the year (2011-2012). Dr. Baez also completed post-graduate studies in Transplant Nephrology at Brigham and Women’s Hospital (Harvard University) in Boston, MA. His work on the pathology of glomerular disease was published by the Puerto Rico Society of Nephrology in 2011. Dr. Baez lists care of the dialysis patient – hemodialysis and peritoneal dialysis – among his favorite aspects of Nephrology. He also is interested in glomerular disease and hypertension. Dr. Baez’ philosophy is that he treats his patients as he would want himself or his family treated. In his spare time, Dr. Baez enjoys sports, biking, and running.